Ever since I heard about the new kids book THE SECRET LIVES OF PRINCESSES by Philippe Lechermeier and illustrated by Rebecca Dautremer, I have been dying to read it. I think the concept for this novel is so unique; and I can't wait to get a peek at the behind-the-scene stories of the not-so-famous princesses. I can already sense how much little girls are going to love this creative and imaginative (and did I mention funny?) look at princesses who are a definitely a bit unusual. I will be reviewing THE SECRET LIFE OF PRINCESSES a little closer to its publication date in the beginning of June; but in the meantime, you can learn more about this book at the official website -- you can already get an idea of how gorgeous the artwork is. Three of the four princess have already been revealed, with another one coming this week. You can also become a fan at the Facebook Page: Being a Princess. In anticipation of the release of this beautiful (and very fun) book, Sterling has graciously offered to giveaway ten packs of The Secret Lives of Princesses Puzzle Cards. There are two different packs of cards, and each one features seven of the mysterious royal ladies from the book, plus a game card. 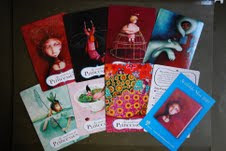 Just follow the instructions on the game card to win a prize at http://secretlivesofprincesses.com. To enter, just leave a comment here with the name of your favorite fictional princess as well as your email address. The contest will be open until Saturday, March 27, 2010 at 11:59 p.m. ET, and I will notify the winners the following day. This contest is open to those of you in the US and Canada only. Good luck! I've always liked Cinderella. I remember reading a Disney book about her over and over when I was a kid. As an adult, I was always fascinated with the real Princess Di. Such a shame that she is gone. I'm not sure if we leave our comment here or at the other site, but in case here, my favorite princess is the one from The Princess and the Pea. Can't say that I have a favorite princess now, but as a girl Cinderella was my absolute favorite! My favorite princess is Princess Buttercup of the Princess Bride movie! My favorite is still Cinderella after all of these years. I've always loved Ariel from The Little Mermaid - she counts right? My favorite princess is Princess Fiona from the Shrek series. I love Princess Leia from the original Star Wars. I had the coolest action figure of her when I was a kid. Her hair was the coolest! Princess Tiana from princess and the frog.